Snakes are elongated, legless reptiles with dry, scale-covered skin. They lack movable eyelids and external ear openings. There are approximately 2700 species of snakes known to humans. In the wild, they inhabit a wide range of habitats: land, trees, under ground, fresh and salt water. Snakes are exclusively carnivorous (meat eating), although the type of prey varies and can include fish, rodents, birds, eggs and even other reptiles. Snakes are categorized into two groups: constrictors (kill their prey by wrapping their body around it and squeezing until suffocation occurs) and venomous (kill their prey by injecting a venom or poison with a bite). Venomous snakes are not considered pet species. Reptiles are ectotherms (cold blooded), dependent on environmental temperature to regulate their body temperature. It is important to research the species being kept in order to provide the proper environment and care. An enclosure should mimic the natural environment in which the snake normally lives. It should be easy to clean, well ventilated, properly lighted and heated and escape proof. A glass or plastic aquarium or terrarium with a tightly fitting lid or a specially designed enclosure with latched sliding front doors is preferred. The environment must be large enough to allow the snake room to stretch out and move freely. Snakes rely on the environmental temperature to regulate their body temperature. Increasing and lowering body temperature helps to digest food, grow, fight disease and reproduce. The optimum ambient temperature and a thermal gradient (hotter and cooler spots) must be provided to maximize the snake’s health. Each species of snake has a preferred optimum temperature zone or range (POTZ/POTR) in which its body systems work most efficiently. If kept higher or lower than the POTZ, medical problems will result from the continual stress the snake is experiencing. In their natural habitat, reptiles deal with temperature extremes by sleeping through the hottest part of the day, burrowing underground where the temperature is less affected by the conditions, or by partially hibernating (aestivate in summer or brumate in winter) to conserve their body fluids and energy. In a captive situation, the reptile’s options are considerably reduced, as within the confines of an enclosure, gradients and microclimates are more difficult to achieve. As a result, several aids must be purchased to set up a sufficient enclosure for a pet snake. Heat sources such as heat lamps, heating pads or heating tape are preferred. Choose non-light emitting or ceramic bulbs, as continual light will interrupt the snake's sleep patterns. Heat sources should be continually available, with a primary heat source creating the preferred ambient temperature and a secondary heat source creating a basking area. Both day and night gradients should include a basking area where a microclimate of increased heat is provided. Bulbs should be secured in such a way as to ensure the snake cannot come into direct contact with them. Heat rocks are never recommended, as they are poor radiators of heat and direct contact with the hot surface temperature leads to thermal burns. Thermometers are essential tools with which to measure heat in the enclosure. Multiple thermometers or a digital thermometer gun allows quick assessment of the ambient and basking temperatures. Temperatures should be checked daily to catch system failures or fluctuations that may adversely affect the animal. Snakes have a less defined requirement for humidity gradients. All species of snakes require at least a small microclimate of humidity to aid in shedding and defecating. Overall tank humidity can be provided in varying degrees via open water dishes, spraying or misting the tank, or misters and drip bottles for a higher humidity. Snakes from drier climates seek humid spots in burrows or under rocks. A plastic container filled with sphagnum or peat moss set over an under tank heater and misted frequently mimics this. Humid or shed boxes should be cleaned weekly and always checked to ensure they are warm and moist not cold and damp. Measure humidity regularly with a hygrometer. Too much humidity in a tank can predispose the snake to respiratory and skin disease. Substrate should be safe and easy to clean. For a simple and easy to clean substrate, newspaper, astroturf® or a reptile turf or felt make good choices. When using turf, ensure that the edges do not fray, and change and clean the turf regularly to prevent mold and fungus from growing underneath it. Cutting two pieces for the tank allows quick replacement while cleaning and drying the removed piece. If housing a burrowing snake, avoid corncob, kitty litter, wood shavings, dirt or gravel as these can be swallowed and cause impaction and also promote bacterial or fungal growths in the enclosure. Substrates such as sterile sphagnum moss, cypress or fir barks or sterile sand are preferred and should be at least 2-4 inches in depth. Always provide at least two hide areas, so the snake can safely get out of public viewing. In a natural setting, many snakes hide under rocks, leaf debris, or in shallow burrows to escape both being seen and the extreme temperatures of the day. Hides should be made of an easy to clean material and be large enough to fit the entire animal, but snug enough to provide security. Provide branches and logs for arboreal and semi-arboreal species (tree dwellers), avoiding forked branches that could potentially trap the snake. UVB lighting requirements are controversial in snake species. Logically, sunlight, whether direct or filtered, will contact a snake’s body in a day, providing the necessary Vitamin D3 needed to help absorb calcium in the body. Natural sunlight produces healthy bones, stimulates the appetite and immune system and in many of the snake species, shows the beautiful colour nuances of the scales. Sunlight through a glass window or plastic lid actually filters out the UVB rays removing any benefit. Lights should include both the UVA and UVB spectrum. The light should be placed above the tank at an optimum of 18 - 24 inches from the reptile. Most ultraviolet lights (other than the mercury vapour bulb) do not produce significant heat and should not be considered a source of primary heat. Ultraviolet lighting should be changed regularly, according to manufacture recommendations. Cleaning and disinfecting should be done on a regular basis. Droppings should be removed immediately and complete cage cleaning should follow a schedule appropriate to the size of the tank. Keeping loose substrate in shallow containers allows for easier removal. Without the wind, sun and rain to naturally clean the substrate in which the snake lives, regular cleaning is the only defense against bacteria, fungus and mould building up in a reptile’s tank. When cleaning, do not use products such as Lysol®, PineSol®, or Dettol® as these are poisonous to reptiles. A dilute bleach and water solution, or a formulated disinfectant such as Virkon® are safe. Rinse well and ensure there are no residual fumes. Quarantine any new reptile entering the home. 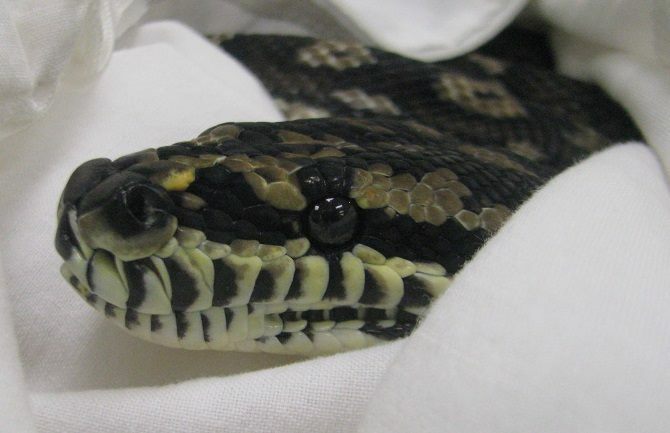 Deadly viral diseases are not only transmitted by direct snake-to-snake contact, but can be transmitted through the air or via vectors (objects that carry the agent causing the disease). Depending on the species in the collection and the species being added, quarantine should range from one to several months (boids and pythons) and quarantined animals should always be fed, cleaned and handled last. All snakes are carnivorous. In the wild, prey includes birds, small mammals, frogs, eggs, invertebrates and even other snakes. In captivity, food sources typically include rodents (in various stages of development), rabbits, fish, and eggs. Snakes that naturally eat lizards and amphibians may have difficulty initially recognizing rodents as prey. It is important to feed whole food items to meet the snake’s nutritional requirements. 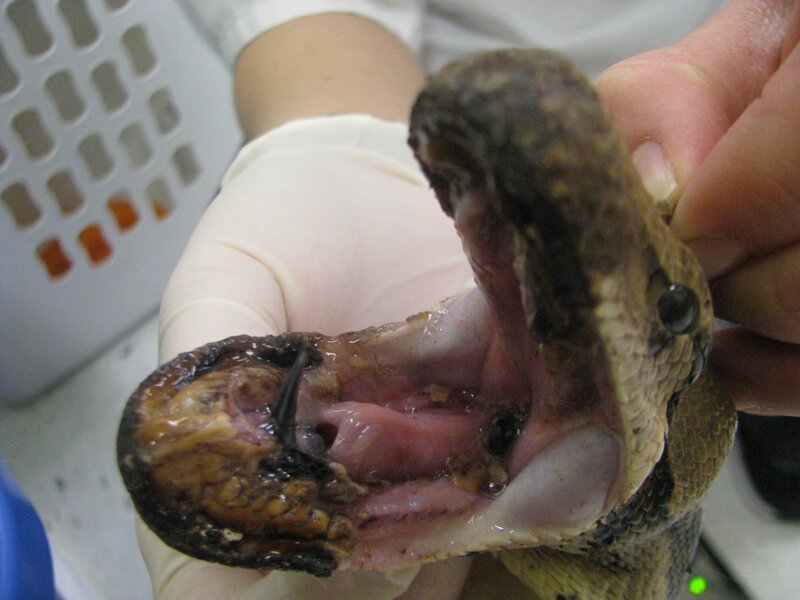 Snakes can be exposed to infectious agents through the food they eat. Prey items should appear healthy and come from a reputable source. Although a whole prey diet is nutritionally complete in nature, snakes without a UVB light source and repeatedly fed the same food should be given a vitamin and mineral supplement every second or third feeding. Nearly every snake can be trained to accept dead or incapacitated prey. The idea that feeding live prey is ‘more natural’ cannot apply to a captive reptile where nothing about its existence is natural. Feeding frozen thawed prey is not only more convenient for the owner, it is much safer for the snake and more humane for the prey. Frozen prey should be thawed prior to feeding (put in a plastic bag in warm water). Feeding should be carefully supervised. If the snake shows no interest in the prey within 15 minutes, remove it and try again later. Extreme caution should be used when feeding a hungry snake as it may strike as soon as the enclosure is open. Long forceps and carefully washed hands can help prevent injuries to the handler. Snakes housed together should be separated prior to feeding. Feeding frequency and amount depends on size, age, species and condition of the snake. Knowledge of when a snake eats naturally (day, sunset, night) can increase the feed response and respects the natural rhythm of your pet. Juveniles and smaller species are fed more frequently than adults and larger species. Generally speaking, adult snakes are fed every 2-3 weeks. Typically, a snake should defecate prior to its next feeding. Water should be provided at all times. Most snakes drink infrequently, but a suitably sized water container should be provided for the snake to immerse itself to soak and the water helps humidify the environment. The water container should be cleaned and disinfected regularly. Handling: A newly purchased snake should be allowed time to acclimatize to its new environment and feed at least once before daily handling. 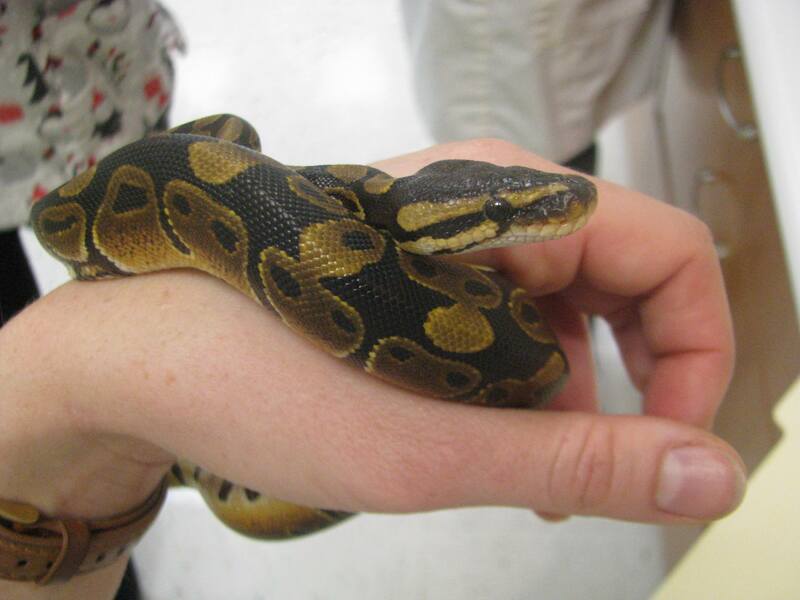 Handling a snake 10-15 minutes a day can help adapt the snake to human touch and allows a quick exam of your pet to look for any abnormalities. Too long out of its environment cools the body temperature of the snake and causes stress. Avoid handling after feeding to prevent regurgitation and do not handle snakes coming up to a shed to prevent scale damage and respect the stressful process of shedding. Small children should always be supervised when handling a snake and careful hygiene should be practiced. (See our handout on Salmonella). Shedding is the process by which snakes periodically discard the outer layer of their skin. Ecdysis is under hormonal control and is associated with growth. Young, actively growing snakes will shed more often then mature snakes. Snakes are often inappetent and inactive for 1 –2 weeks preceding a shed. 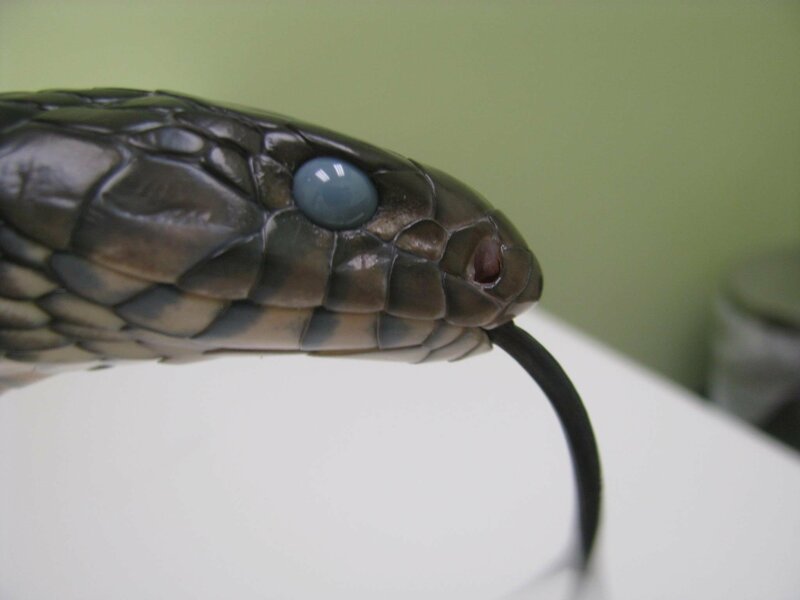 The skin, including the eye caps (spectacles), takes on a dull blue appearance. A healthy snake will shed its skin in one piece, including the spectacles. Keeping a diary of your pet snake, noting sheds, condition of shed, when and how much the snake eats and defecates, is a useful reference. Dysecdysis: Several factors, including humidity, nutrition and general overall health, can result in an incomplete shed by the snake. Retained pieces of skin can prevent proper growth and retained eye caps can lead to eye infections. Consult a veterinarian if your snake persistently has a poor shed. Blister disease: This is a common skin ailment caused by bacteria, viruses, or fungi. Moist, dirty enclosures predispose the snake to this syndrome. 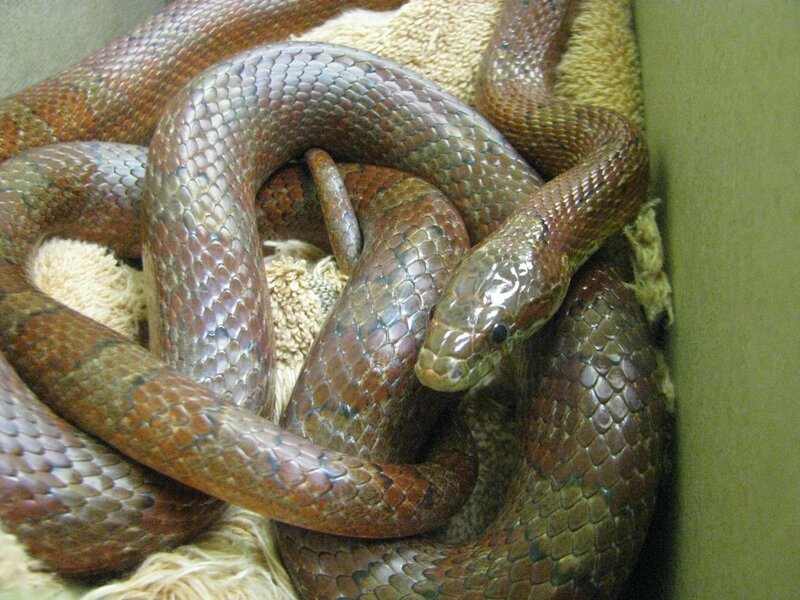 Early signs include reddening and blistering of the underside of the snake. This disease can quickly become life threatening. Changes to the skin warrant a veterinary visit. 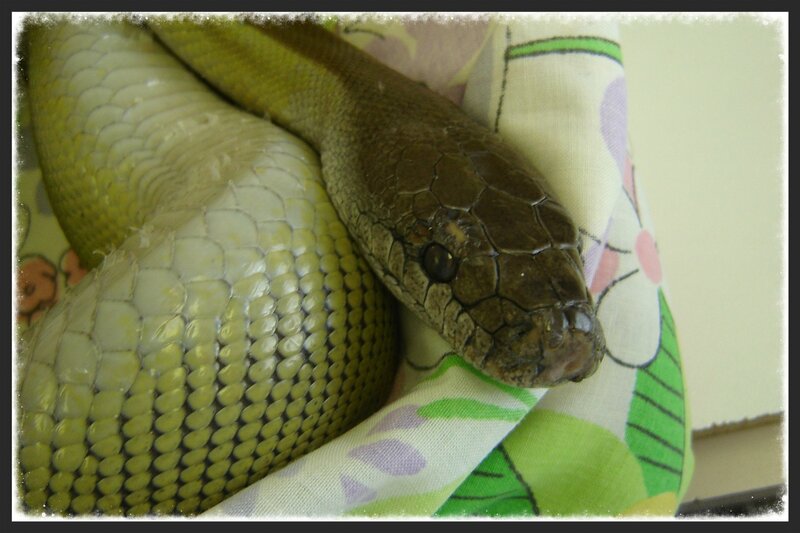 Pneumonia: Respiratory infections are common in snakes. They can be associated with mouth rot, septicemia, bacterial, fungal, parasitic, or viral infections or poor living conditions. Signs include loud noises when breathing, fluid bubbling from the mouth or nostrils, open mouth breathing, inappetence, inactivity and extending the head and neck vertically. 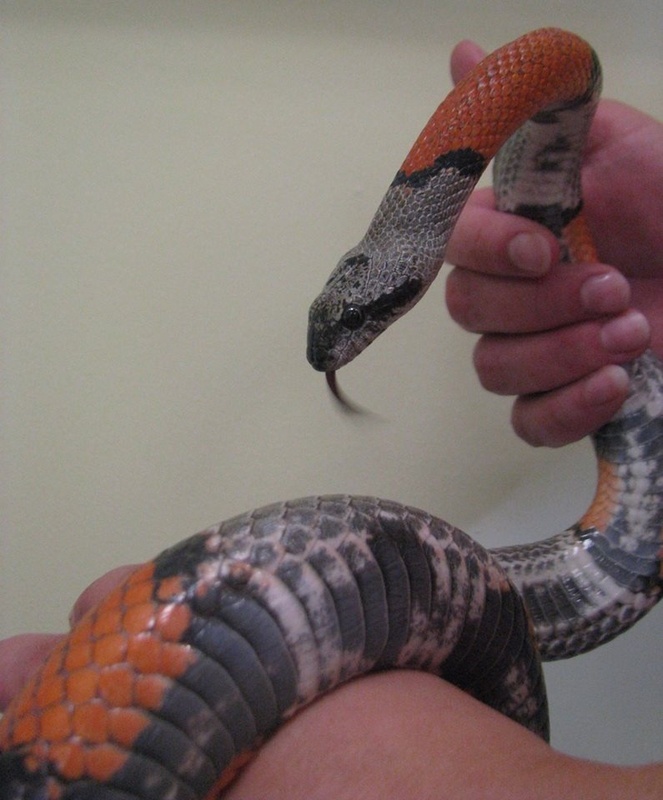 Respiratory disease is serious in snakes and requires veterinary attention. Anorexia: Lack of desire to eat is a symptom, not a disease. Many problems can lead to anorexia. Persistent refusal of food should be discussed with your veterinarian. Parasites: Snakes can be affected by internal and external parasites. Routine examination and treatment is recommended. A captive snake is less able to cope with parasites given the other stress factors of captivity. External parasites often act as vectors of more serious viral diseases. Infectious stomatitis: ‘Mouth rot’ is a progressive bacterial or viral infection involving the lining of the mouth. Early signs include abnormal lip placement, excess salivation and inappetence. Intervene early. Inclusion Body Disease: Boas and pythons are susceptible to this disease; believed to be caused by a retrovirus. This disease can manifest as acute, characterized by sudden flaccid paralysis or chronic, affecting the nervous system and causing regurgitation, inappetence and pneumonia. There is no treatment for IBD and the diagnosis is often made on post mortem. Careful quarantine of all new snakes is the best prevention of this disease. Public Health: All snakes may carry Salmonella. We recommend reading our handout on this zoonotic bacteria and taking the appropriate precautions. 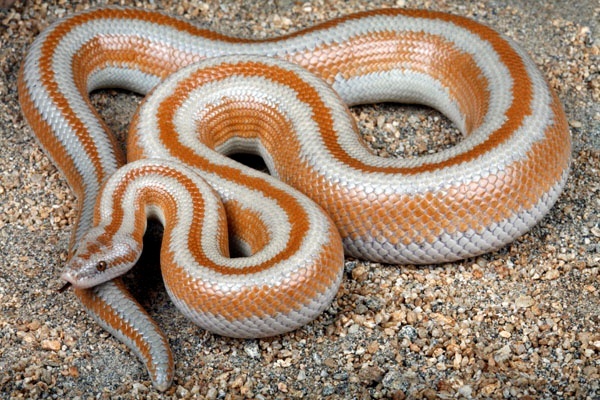 The Rosy Boa and its cousin, the Rubber Boa are both in the Charina genus and are found in SW USA and Mexico. Rosy Boas are nocturnal snakes that grow to 2-3 feet and live 15+ years. Rosy Boas are live bearing and are true burrowing snakes, requiring substrate at least 2-4 inches deep. The Rosy is found in arid to warm savannah terrain with little rain. Daytime and nighttime temperature gradients range from 73-83°F (23-28°C) with the humidity around 55%, but because they are typically underground, the temperature and humidity are more constant. Both of these species fall in the Lampropeltis genus. They are moderately sized and docile snakes found throughout the USA, Southern Ontario and Quebec and into Central and South America. Habitats include deserts, swamps, forests and grasslands. Ranging 3-7 feet long, they can live up to 20+ years. Both Milk and Kingsnakes lay eggs and are most active at dawn and dusk. These snakes are good at escaping their enclosures, so a tight lid is important. Temperature gradients should range from 76-86°F (24.5-30°C) in both a horizontal and vertical gradient and nighttime temperatures should average 70-73°F (21-23°C) with a basking area of 73°F (23°C). These snakes prefer a 40% relative humidity. The Boa Constrictor is a long-lived and large snake and only those willing to make the commitment to its care should own one. These snakes can grow to 10 feet in length, weigh over 25 kg and have a life expectancy of 30+ years. Boas are from South America and the 7 subspecies range in habitat from cloud forests to lowland areas. They are primarily nocturnal snakes and bear live young. Other than the rain forest dwellers, boas will go through periods of inactivity when humidity is too low or temperatures are too cold. Boas require daytime temperatures of 82-90°F (28-32°C) with a basking area of 90-95°F (32-35°C) and nighttime temperatures of 78-85°F (26-30°C) with a basking area of 85°F (30°C). Relative humidity should be around 60%. This species of snake comes from Central and Western Africa and is also called the Royal Python. Over the last few years, it has been bred to come in several morphological colours. Most active at dawn and dusk, this snake lives on the ground or in the lower parts of trees. Because this python does not eat mice naturally, it eats lizards and frogs; many balls can be challenging eaters. The Ball Python is sexually mature at 3-5 years and is an egg layer. This is a long-lived snake (oldest recorded over 40) and grows to 4 feet in length. This python comes from temperate to arid climates and requires daytime temperatures of 80-85°F (27-29°C) with a basking area of 90°F (32.5°C) and nighttime temperatures of 73-75°F (23-24°C) with a basking area of 80°F (27°C). An ambient relative humidity of 50% is adequate with a shed box of 65%. Both these snakes are in the genus Elapha and are found throughout the USA and Mexico in forests, rocky hillsides and farmland. These snakes are ground dwellers but are considered semi-arboreal. They grow to 3-4 feet in length and can live an average of 10-15 years. They are most active from dusk to dawn. They are egg-layers and reach maturity at 2 years of age. The young of these species eat primarily invertebrates such as crickets but as they grow, they incorporate fish, frogs and rodents into their diet. Corn and Rat snakes require a temperature gradient of 75-85°F (24-29°C) with a basking area of 85°F (29°C) and nighttime temperatures between 70-75°F (21-24°C) with a basking area of 75°F (24°C) and a relative humidity of 40%. Is your snake not listed? Check out Melissa Kaplan at www.anapsid.org or Reptiles Magazine at www.reptilesmagazine.com for more information on the species you have. 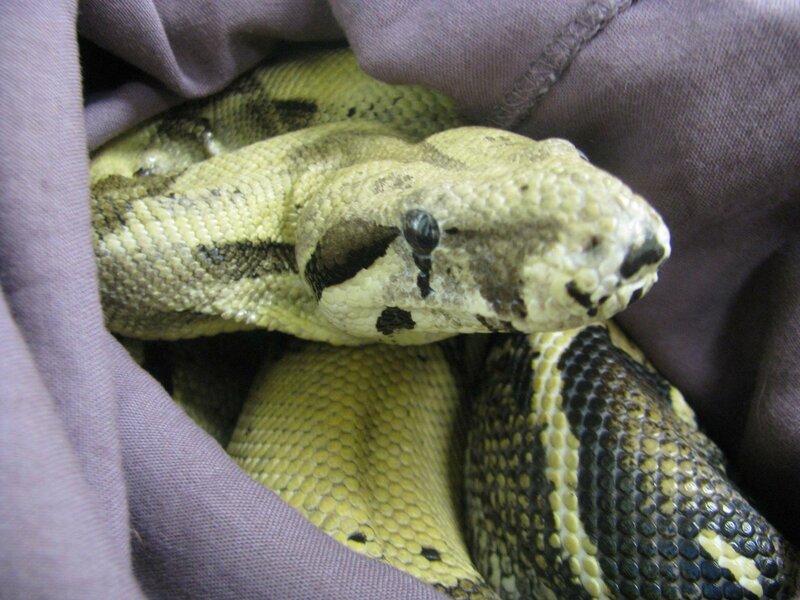 It is recommended that all snakes have a yearly health exam by a veterinarian experienced in the care of reptiles to aid in the early detection of any problems and to allow a chance to update owners on the latest in care and husbandry.